The demand within the global market for infusion pumps has been rising on account of advancements in the domain of healthcare over the past decade, finds Transparency Market Research (TMR). The market players operating in the global market for infusion pumps have been focusing on tying up with health centers and hospitals in order to expand their market share. The vendors are also projected to capitalise on the growth of healthcare centers across the globe over the coming years. The key strategies of the market vendors in the global market for infusion pumps include acquisitions, strategic alliances, and partnership. The smaller vendors in the global market for infusion pumps have been following the footsteps of the established firms in order to steer clear of the hindrances. These small vendors have been making robust investments towards the development of high-quality products. The larger market players have attained solidity in the market by continually revamping their business strategies according to the needs and demand of the consumers. Furthermore, the market for infusion pumps is closely related to the healthcare industry which has led the market vendors to stay abreast of the trends that are surfacing in this industry. It is expected that the medium-sized market vendors in the global infusion pumps market would enhance their growth prospects by entering into strategic partnerships with larger players. The global market for infusion pumps is projected to expand at a moderate CAGR of 5.40% over the period between 2018 and 2026, as predicted by Transparency Market Research (TMR). Furthermore, the global market for infusion pumps is expected to accumulate revenues worth well over US$ 10,000.0 Mn by the end of 2026, rising up from a value of US$ 7,036 Mn in 2017. On the basis of product type, insulin pumps are in great demand across the globe. Based on geography, the demand for insulin pumps in North America is expected to touch new heights in the years to come. The demand within the global market for infusion pumps has been rising on account of the rising geriatric population across the globe. This trend can be explained by the fact that the elderly people are frequently in need of medications that are often administered intravenously rather than orally. Furthermore, chronic diseases such as cancer, diabetes, and cardiovascular disorders often render patients weak and unable to eat which also calls for the use of infusion pumps. The administration of drugs, dextrose, plasma, and saline fluids into the body is done through the use of infusion pumps, and this also enhances the growth prospects of the global market. Ambulatory implantable devices incur heavy expenses, and this has become a major restrain in the growth of the global market for infusion pumps. Furthermore, healthcare sectors across a number of underdeveloped regions are still barred from the usage of infusion systems due to the limitations of the healthcare sector in these regions. Despite these factors that could hamper the growth of the global market for infusion pumps, the demand within this market is expected to keep soaring as better medical reimbursement policies are introduced by the governments. 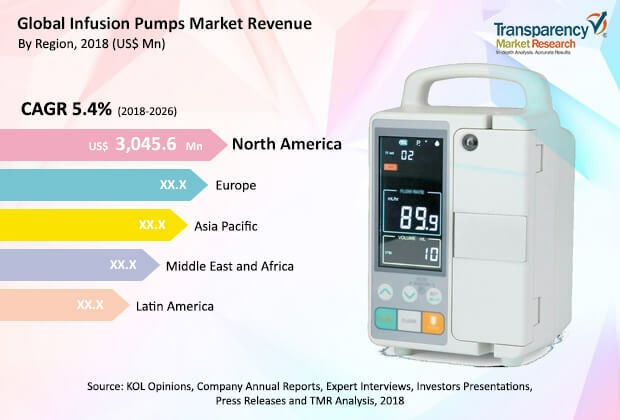 The review is based on TMR’s report titled “Infusion Pumps Market (Product Type - Insulin Pumps, PCA Pumps, Enteral Pumps; Application - Diabetes Management, Pain Management, Chemotherapy; End user - Hospitals, Ambulatory Care Settings, Home Care Settings) - Global Industry Analysis, Size, Share, Growth, Trends, and Forecast 2018 – 2026”.